This decade has proved to be the most progressive one in terms of technology especially in the transportation sector. We are already getting used to the idea of having autonomous cars around us even in the form of a taxi. After this, the innovative way to commute which not only excites young kids but also we as adults are flying cars. The time when we can sit in one of these cars and view the world from a height is approaching. Various automakers are already under the process of testing these cars and getting them on the runway as soon as possible. Here we have a compilation of five flying car companies which are eagerly waiting to put these vehicles out in the market. Earlier this month, reports had surfaced the news saying that Volvo’s parent company, Geely, acquired a flying car startup under its name. This startup supposedly makes the most promising flying car in the entire world. The startup Terrafugia is mainly popular for its impressive transition of a car to a plane and vice versa. Terrafugia also gets the credit for being the first company to register this car/plan hybrid prototype under its name. The design of this flying car is way sleeker than its counterparts. The Federal Aviation Administration has certified this vehicle as a Light Sport Aircraft. Another added advantage of this car is the updated artificial intelligence software installed in it. Another flying vehicle competing for the certificate of a Light Sport Aircraft is the AirQuadOne. This is not exactly a flying car but more of a flying quadbike. It takes off and lands in a vertical manner, and has the seating which resembles a land-based bike. This vehicle has the ability of flying to the altitudes of 3,000 feet and speed up to 50 miles per hour. Mainly intended for personal transportation, it will soon replace cranes and helicopters. This fully electric vehicle weighs around 500 kg. It offers various modes such as heavy lifting, active defense, parcel transportation, robotic maintenance, leisure, and extreme sports. This vehicle is compatible with any normal electric car charging station. This is not exactly a flying car but more of a flying quadbike. Another automaker which announced its acquisition of a flying car startup is Toyota. In May 2017, it acquired Cartivator which is led by a drone specialist Masafumi Miwa. Toyota undertook this project to produce a flying vehicle on a speedy basis with the aim of lighting the torch of the 2020 Olympics with this. ‘SkyDrive’ can fly 33 feet above the average ground level at an astonishing speed of 100 km/h. At a length of only 9.5 feet, it is the smallest flying vehicle. This flying vehicle comes with an intuitive nature which lets a layman control it and is flexible enough to take off from any ordinary highway. ‘SkyDrive’ can fly 33 feet above the average ground level at an astonishing speed of 100 km/h. This startup seems to be the most promising out of all the flying car companies. This is because of the name it is associated with. The name here itself must ring a bell. Larry Page, the founder of Google, financially backs this flying car project. Kitty Hawk Flyer, the aircraft is an all-electric one which can also operate over water without the need of a pilot’s license. The main selling point of this flying vehicle is that it assures that anyone can learn to fly it within minutes. The consumer version of this vehicle will be out in the market by the end of this year. As it comes under the Ultralight category, it is every common man’s dream come true. This glorious piece of technology was first showcased at the Paris Air Show. 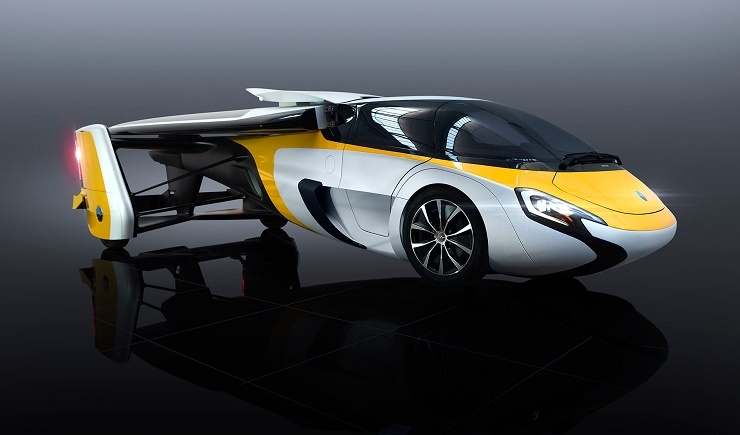 AeroMobil is undoubtedly said to be the best company when it comes to flying vehicles. This is one such flying car technology that is efficient on land as well as in the air. On land, this hybrid can speed up to 100 miles per hour. It soars through the skies at a maximum speed of 465 miles per hour. Approximately, it will be out in the market on sale by 2020.